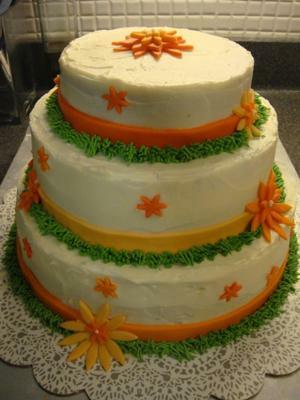 This Autumn wedding shower cake is 3 tiers iced in buttercream. I used the grass tip, and pre-made fondant for the borders & flowers. I used the Wilton fondant cut-outs to make the flowers. I love the grass tip. Can also be used to make fur or hair. Love it too!!!!! Great job! I use that tip for tons of things as well.